An LFL heinously upholding neoliberalism. Okay, the next post will be about writing or something, I promise. Against precedent of having the Justice Department vet pardons, Trump throws yet MORE red meat to his base and pardons the convicted Joe Arpaio. Hurricane Harvey is bearing down on Texas and Louisiana, drenching it in torrents of rain and wind so strong it's swaying concrete buildings. Trump disgracefully issues an order banning transgender service members, after the Joint Chiefs had individually indicated it's a terrible idea on so many levels--not just rights but fighting strength. He also might deputize school safety officers to enforce immigration arrests in the schools, where children are supposed to be safe. This is on top of threatening to hold U. S. hostage, via the debt ceiling, to pay for the ridiculous, racist, and unnecessary wall that he swore to the Trumpettes that Mexico would pay for. With no sense of irony, one of his cabinet said "It'll be like the Maginot Line." Uh, yeah. Ask France how that one worked out. Maybe they ought to go for Hadrian's Wall instead. And this is just an hour's worth of news. That's right, the little free-standing book houses where you can take a book and leave a book. 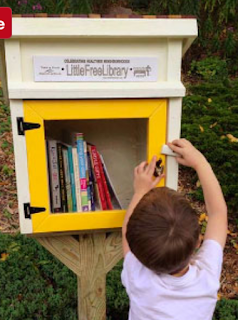 Where little kids can get books for free (and so can adults). Where someone in your community cared enough to put the time and effort in to reach out to neighbors. They don't solve the problem of inadequate library funding, say the rad librarians. True enough. They make people feel good without a radical tearing down of the oppressive structures that enable systemic privilege blah blah blah and you can fill in the rest of this speech yourself. True enough. But shouldn't a small good get the benefit of the doubt? I'm tired of the false equivalence thing not only because in the media it gave us Trump (Hillary's emails! Hillary's emails!--remember that?) but because in giving equal weight to horrible things like white supremacy and the trans ban and things that just aren't quite correct enough, like the Little Free Library, we're squandering an opportunity. And with things the way they are, we don't have the luxury of wasting opportunities to set things right. How can we write in the current environment? I saw a tweet the other day that said something like "I hope I can put the 6 hours a day I spend watching the news about the U.S. destroying itself on my annual review." Amen to that. I know that this is a first world/academic world problem, and it's insignificant in the face of what Charlottesville has suffered and what continues to happen throughout the country, but it's a problem nonetheless. How do we keep calm and carry on, as the Brits say, when there's a fresh ! @#$show every time we open our laptops? How can we develop consecutive thoughts about research when the country is being run on the reality show principle that every day is an escalation of the worst of the day before? When Nazis are back and racism is horrifyingly endemic? I might be ripped apart for saying this, but we were making progress on racism. Obama did give us a sense of hope. Now the president endorses white supremacy, and the Congress does nothing? Is this the United States? And what if we are horrified by what's happening but express ourselves incorrectly? For example, Tina Fey did a sketch recently about eating sheet cake to drown out stress or to satirize people's desires to turn away rather than to protest. I didn't think it was hilarious but thought it was okay--until social media tore her a new one, pointing out the parallels to Marie Antoinette, branding her with the most heinous of insults--"liberal" and "neoliberal" and "racist"--and generally taking her down. It feels disloyal or traitorous, somehow, to write about something other than the events that are happening around us. About the only non-news things on Twitter, for example, are those that are put out by twitterbots, which would churn out tweets if the sky was falling, which it kind of is. If we need to write about our actual research, we seem unfeeling or uncaring (we're not). Ditto for teaching, with each fresh tragedy appropriately bringing with it a "syllabus" to teach resistance to the Nazis. Yet we have obligations that demand other kind of content, and we have to consider that, too, don't we? I have research-related posts and writing that I want to do, but I keep thinking I'll wait for the ! @#$show to end or at least die down. Like the never-ending heat this summer, though, it never does. The Westly, apparently one of the top 4 models. As a chaser from current news and the last post, I give you some Sears homes. With Sears in its current cratering state, it's possible that people don't know that it once shipped not only girdles, engagement rings, and farm equipment, but houses. 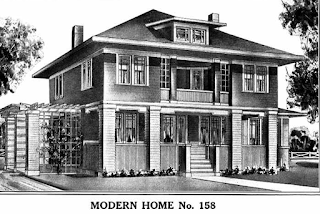 From 1908-1940, you could have all the pre-cut materials shipped to you on a rail car (plumbing and heating extra) and build the home on your own lot. The lot sizes were included so you could decide. This fancy model has a servant's room. These were well-built homes, and especially if you live in the Northeast or Midwest, you've probably seen them. This site (http://www.searsarchives.com/homes/1908-1914.htm) has pictures and floor plans, and if you're looking for distraction, it's a great place to visit. Here are the most popular models. Floor plan for "Modern Home #115" from 1908-1914. It's an interesting tour through the early twentieth century, too. The earliest plans don't include bathrooms as a matter of course; the later ones do. The one at left has a pantry, parlor, 3 bedrooms, and an attic but no bathroom. 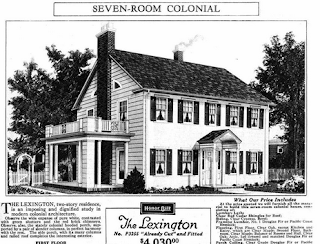 You can see the trend toward neo-Colonial versions emerge in the 1930s, with names like "The Salem" and "The Lexington," but the majority continued to be bungalows. One defining feature seems to be whether the homeowner was willing to pay for extras like dining rooms and hallways--not so different from today, really. By 1940, the homes are virtually all two-story or 1 & 1/2 story models, more Cape Cod than bungalows. After the war, one of the hit movies celebrating/satirizing individualism in home ownership was Mr. Blandings Builds His Dream House (1948). You can see a clip from it above. (The completely blank stare from Cary Grant when he doesn't have the faintest, foggiest notion what the builder is talking about is priceless. I have so given that blank stare at being given a choice between two options when I didn't even know there were options to be considered.) There were a lot of these houses built, too, all over the country, including Northern Clime. 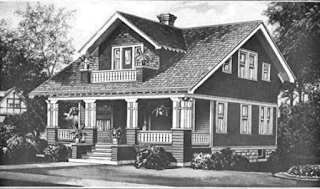 Do you have any Sears homes in your neighborhood, or have you seen any? I've been gone again with travel, and more travel, and still more travel via planes, trains, and automobiles. I'm home for now, though. While away, I barely looked at the news. It is always depressingly the same: the President is a crazy person who threatens all our lives with his stupid, showy, dangerous posturing, the only certainty of which is that he times each new outrage to the daily 24-hour news cycle before moving on to the next. In the meantime, his administration guts the hard-won protections (EPA, health care, women's rights, voting rights, the social safety net for the elderly, immigrants, the poor, and the rest) that keep us functioning. How is it that random violent idiot terrorists--er, "low-information voters for Trump"--can dress in camo and patrol the streets with assault rifles, which we're not allowed to call assault rifles officially because the NRA has a fit, as if this is a normal thing to do? People are being raked over the coals on Twitter for asking questions like "how did we come to this?" and "what can we do?" so I won't ask those. But I do think about people of my parents' generation, the older ones of whom fought in World War II. A close family member was a pilot and flew during the D-Day invasion and the Battle of Remagen. Other families have heard stories from Holocaust survivors. Did we really go through all that to have Nazis here in this country? I know that the U.S. has a fraught history of racism and isn't close to perfect. But we are better than this and need to show it.